Seattle Opera’s glass-clad, $60 million headquarters at Seattle Center, which the company plans to move into this fall, is representative of how it hopes to invite the public behind the scenes of one of the most complex art forms. In recent months, Seattle Opera has been putting up the last steel beams and constructing the exterior frame of its new Seattle Center headquarters, all to prepare for the glass that will eventually encase the building and serve as a symbol of how the opera plans to connect with the public. 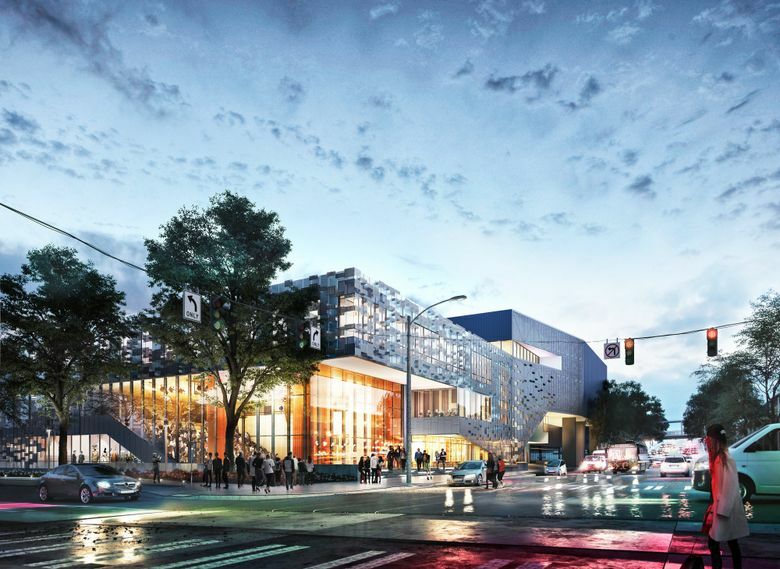 The glass walls of the Seattle Opera at the Center building at Mercer Street and Fourth Avenue North will be a far cry from the opera’s current administrative space. But they are also a way to literally and figuratively invite the public behind the scenes of one of the most complex art forms. The public, for instance, will be able to peer through the glass to see performances and lectures in progress, and people at work in the costume shop. For the employees of one of the state’s largest arts organizations, and one of the nation’s largest opera companies, it’s a welcome move from their inefficient and uninspiring space in South Lake Union. They hope it will lead to more interaction with fans and, crucially, people who’ve never before considered caring about opera. “We’ve deliberately crafted a building which is all about making connections with the people outside,” said general director Aidan Lang. Staffers are quick to express gratitude to the local family that has leased them their current administrative space in South Lake Union at below-market rates since the 1990s. But the converted warehouse built in the 1940s is at the end of its natural life. It’s hard to navigate the maze of small rooms and cubicles in the current space, and people with mobility issues must use a freight elevator. The acoustically imperfect rehearsal space is next to an unheated loading dock. Water drips from the ceiling in places; no one is sure where it’s coming from. The opera’s lease is up at the end of 2018 — just in time for the company to move in November. The new building — adjacent and connected via two doors to McCaw Hall, where the opera performs and holds its dress rehearsals — should help streamline the months of preparation that go into each performance. Currently, sets — shared with other opera houses — are shipped in and stored in multiple places before the final move to McCaw Hall. Costumes are stored and altered at the South Lake Union offices, which means a costume needing repairs during a dress rehearsal must be driven back and forth through a high-traffic part of town. In the new building, sets will go directly to storage space next to McCaw Hall, and costumes will be steps away from the stage. The efficiencies should save the opera money in time and staffing — one of the responses Lang gives when people ask if this is a responsible use of money in an art form often short on cash. Seattle Opera has had budget trouble, but the company says revenues now exceed last year’s at this time. Lang also said enthusiasm for funding the new building may have helped raise money for ongoing expenses. The opera has raised 91 percent of the $60 million project cost ($46 million of that is from private donors; $14 million from public funds). 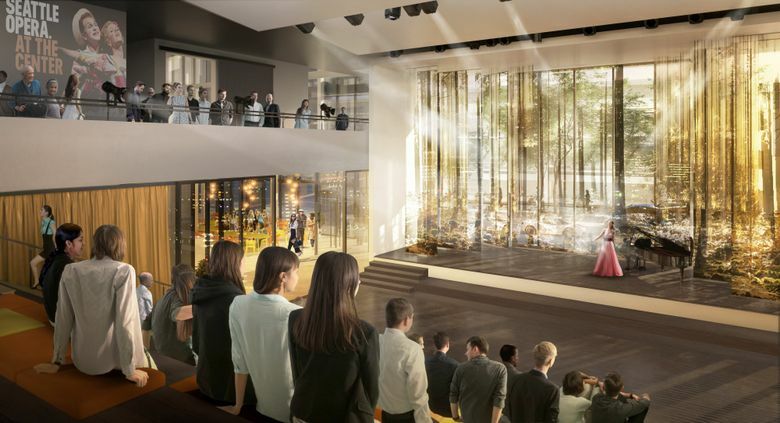 For the public, the invitation into opera will begin on the outside corner of the building: An auditorium with glass outer walls will allow passers-by to look in on performances and lectures. Plans for the space include lunchtime recitals open to the public. Around the corner, visitors will be able to look down from a garden walkway and watch workers in the costume shop. Part of the education area and one of the three rehearsal spaces will be clad in glass and visible from the street. People with disabilities should have no trouble getting around, and patrons will be able to buy tickets and get information in person next door to the performance hall. “This will be a way to really help the general public to see the opera in the making,” said Barbara Lynne Jamison, Seattle Opera’s director of Programs and Partnerships. Seattle Opera will be able to produce more chamber operas, which require smaller casts and orchestras and less complicated sets. It presented one such opera, “The Combat,” last year, but the building’s logistics limited them, Lang said. Many of the advantages won’t be obvious from the outside. The opera plans to expand educational outreach, which has been limited by a lack of rehearsal and preparation space for performances in schools. Youth camps and workshops will use the new building, too. 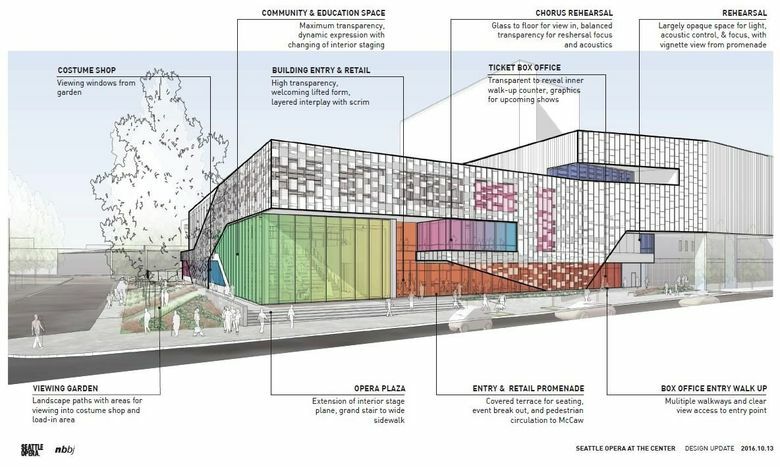 It also plans to host classes in everything from singing to libretto writing to set-building for people of all abilities and experience levels. Seattle Center officials hope the more interactive new building will act as a cornerstone for one of Seattle’s most communal public spaces. It’s one of many ongoing upgrades to Seattle Center, including a revamped Space Needle, a new KEXP radio studio, and the planned KeyArena remodel. The recession put the brakes on doing much until 2014, when Seattle Opera’s governing board moved ahead with the fundraising and building plan. The city granted money from the sale of a land parcel on Mercer that a private foundation had donated to Seattle Center; a developer will build affordable housing there. The foundation gave the rest of the parcel directly to the opera, which sold its portion in 2017. The opera’s timing was perfect: It was able to raise millions of dollars during the city’s most heated economic boom since the Klondike Gold Rush. The timing is crucial, as opera itself is changing. For decades, its audiences aged and perceptions of it as an art form for rich snobs persisted. As older patrons began dying off, opera realized it needed to change to survive, especially in the U.S., where arts get less government support and depend on audiences and donations to stay afloat. Companies are realizing they need more ways to draw people in, said Scorca of Opera America. Seattle is ahead of this curve in some ways, drawing younger and more diverse patrons through video and in-person previews, and tackling opera’s problems head-on with re-evaluations of problematic works such as the recent “Madame Butterfly,” Scorca said. Lang said the new building will help it continue that mission.